Legacy Family Tree – Unlocked! (2013, 236 pp.) is a new book by Geoff Rasmussen. Our genealogy library now has a copy shelved in Research. 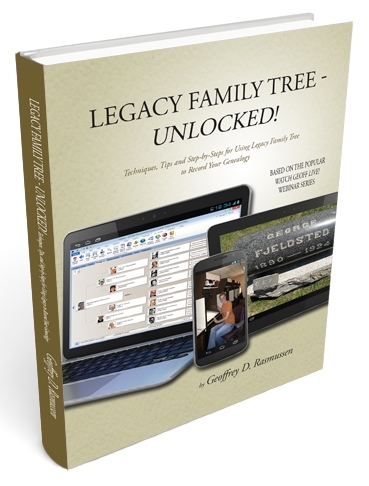 We also acquired the book Legacy 8.0 Family Tree and a five-DVD set Learning Legacy 8.0 Video Training: Volume 1. These are on the No Circulation shelf. Geoff’s book, like the talks he’s given here, is lively and entertaining. It focuses on Legacy but also mentions websites he finds useful, like Steve Morse’s One Step and FindAGrave. He gives real examples from his own research and illustrates with photos from his road trips. Legacy Family Tree 8.0 is a user’s guide. It’s not so much fun, being a reference book where you look up how to do something in Legacy. Chapter 18, “What’s New in Version 8.0,” is worth a look even for experienced Legacy users. Researching with Legacy: Events and Chronologies. Everything mentioned here will be of special interest to members of our Legacy SIG. Thanks to Barb Krecklow for recommending these items for our library. This entry was posted in Library, SCVGS and tagged Library. Bookmark the permalink.